Japanese Episode DP 155: "Double Battle! Mammoo and Hinoarashi!!" American Episode 1250: "Double-Time Battle Training!" Nozomi is competing for her fifth Contest Ribbon in Mekyabetsu Town! After a fierce battle, Nozomi arises victorious and qualifies for the Grand Festival! After the Contest, a party is thrown to celebrate Nozomi's victory. 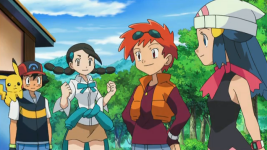 There, Hikari tells Nozomi that she's planning to participate in the Asatsuki Town Pokemon Contest and try her hand at a double contest battle. Later that night, Nozomi finds Hikari up training by herself. She becomes impressed by her rival's dedication and offers to help her come up with some new ideas the next morning. Meanwhile, Satoshi learns that his rival, Shinji, has just won his eighth Gym Badge and has therefore qualified to enter the Pokemon League. Outside, Hikari's training begins with a combination of Mammoo's Ice Shard and Pachirisu's Discharge. After a few attempts, she finds that she can't get it to work and asks her rivals for help. Nozomi suggests she try using her newest teammate, Hinoarashi, to see what it can do and then offers to spar with it in a double battle. Hikari agrees, and a battle between Hikari's Mammoo and Hinoarashi and Nozomi's newly revealed Kirlia and Leafia begins. After a bit of warming up, Hikari attempts to pull off a combination of fire and ice that she dubs "Flame Ice." The attack fails, however, allowing Nozomi's pokemon to finish the battle victorious. Feeling that she's headed in the right direction, Hikari packs up her things and leaves with her friends, ready to continue training her pokemon for the big Contest. The Shin'ou region is a looooooong saga, and part of what makes it so long is the fact that the writers give us a ton of episodes showing Hikari training for upcoming Pokemon Contests. It's something I really like because it shows us that the writers are planning Hikari's victories in advance instead of what they had been doing before, simply ad-libbing it when they got to the actual episode. Remember how Haruka's Eevee just randomly learned Dig on the same day as that one Contest? Thankfully, episodes like this make sure that crap like that is kept to a minimum these days. Part of what makes this particular training episode stand out to me is that we get to see Hikari and Nozomi actually act like friends. In a series where all the rivals are out for each other's throats, it's refreshing to see two adversaries helping each other out in such a way. I also think it's really nice to see Hikari not solve her problem by the end of the episode and instead simply settle for making some progress. Would you have really wanted the writers to come up with some nonsense solution to this problem simply for the sake of wrapping everything up in an episode's 22 minute runtime? Me neither. If I had to pick anything I didn't like about the episode, I'd chose the part where everyone's sitting around that table talking about ice cream. It's cute that they tried to give Hikari an unorthodox way to come up with her combination and all, but the way they actually went about doing it was just sooooooo hamfisted. "Oh look, spicy ice cream! Let's spend an unusually large amount of time talking about something as uninteresting as this. There's no way it'll ever come up again!" A little more subtlety would have been appreciated. Also not a huge fan of them revealing the fact that Shinji got his eighth badge in this episode. Because, God forbid Satoshi let Hikari have an entire episode to herself. Other than the usual music stuff, this episode doesn't have all that much to make it stand out from any other dub episode. I'm still not a fan of Suzuna's dub voice, but she'll go away soon, so whatever. Leafia keeps its Japanese voice. Not really an "edit," per se, but I did want to bring up the fact that the name of the town in this episode, "Brussel Town," is actually a translation of the name of the town in the Japanese version ("mekyabetsu" = "brussel sprouts"). A dialogue edit, in a TPCI episode, involving Team Rocket!? Say whaaaaaaaaaaaaat!?!?!? James: "Cowering in the bushes' silly, even for us." Meowth: "Twerps wouldn't know us if we jumped out and said 'boo!'" Jessie: "They've elevated cluelessness to an art form." In the Japanese version, Kojirou asks why they bothered hiding in the bushes, with Nyasu adding that it's kind of pointless since they're in disguise and all. Then, Musashi tells the others that sometimes, old habits are hard to break. Dawn: "You've got a new Pokémon! Wow!" A new Pokémon? Um, Dawn, you might want to count again. You're facing two new Pokémon, not just one. Dawn: "I'm calling that move 'Flame Ice!'" ...is actually an accurate translation of what's said in the Japanese version. I know! It totally sounds like one of those lame TPCI jokes that they always adds, but it's not.